Director P Vasu is currently busy with Puli Vesham, which has RK in the lead role. Sharing the screen space with him are Sada and newbie Divya Vishwanath. Speaking about this film, Vasu says that RK’s role requires him to don two get-ups of which one is villager. Vasu apparently once remarked to the actor that he needs to slim down to look like a villager. A couple of months later, much to the amazement of the director, RK appeared lean and trim after having shed six kilos. 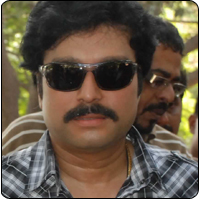 Karthik plays an important role in the film after a long time. The actor is notorious for eluding the shoots and not attending it on time. However, he has now changed his ways and is at the shooting spot much before the scheduled time, says a press release.